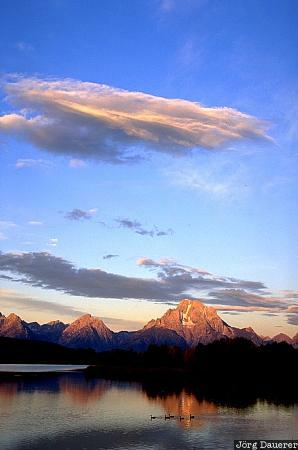 Ducks crossing Oxbow Bend just as the first light hits mount Moran in Grand Teton National Park. below a blue sky with white clouds. Grand Teton National Park is in the west of Wyoming, United States. This photo was taken in the early morning of a sunny day in late September of 2003.